Having participated in such State Legislative Committee meetings since 2003 – both as an invited expert and a public witness – I was appalled by the conduct of the Chair and Chairman. They imposed novel rules that weren’t applied evenly and not only allowed questionable ordering of witnesses; they attempted to control the content of witnesses’ testimony to an extent that I’ve not seen before. As I’ve written before, (See my “Primer for Political Junkies”), Texas has a wonderful system of video recordings which allows us to watch the proceedings of the sessions of the State House of Representatives and Senate and the various Committees of each, both as live-streaming broadcasts as they happen, and indefinitely in the archives. You can watch this particular Committee meeting here, and draw your own conclusions. Consider the comical – and totally unprecedented, in my experience - moment (move the cursor to 1:56, one hour and 56 minutes, into the video) when I was called to the podium by the Chair for signing the form, a fairly standardized written statement, to the effect that I am against HJR 34, by Raymond and for checking the box stating that I did not intend to testify. I would prefer to chalk this gaff up to the Chair’s inexperience, and applaud him for being one of the few Moderators who pronounced my name correctly. (I couldn’t even pronounce “testify” at that midnight hour.) I sympathize with him about what must have been an embarrassing moment with Speaker Straus in attendance. Since I’m on record, several times now, as opposing a Resolution demanding a Federal Balanced Budget, I think I need to explain that while I believe in a balanced budget at all levels of government, I object to any blank check which history has proven cannot be limited. HJR 34 demonstrates the possibility that well-meaning, kernel-of-truth legislation may carry the very real potential for doing exactly the opposite of what we intend, as it calls for " a balanced federal budget as proposed by House Joint Resolution No. ______ or Senate Joint ...Resolution No. ______ of the _____th Congress of the United States." Having seen many examples of "amendments in the form of a substitution," and all sorts of hijacked Bills that contain language that have nothing to do with the original Title, caption, or apparent intent, I would never support this HJR, even if it did not invoke Article V of the US Constitution. Vice Chair Darby interrupted the witness at 2:22 (two hours and 22 minutes), directing her to give her "thoughts." At 2:10, the witness called forward states that he was under the impression that he would testify last! And Vice Chair Darby allows it! Note the witness' patronizing comments about those of us who oppose an "Article V Convention" beginning at about 2:11 in the video. The re-naming of what we used to call a “Con-Con” is followed by redirection of later witnesses -- evidently when the latter disagree with the acting-chair. We are told that opponents (of what we used to call) a "Con-Con" are conspiracy nuts, somehow connected to McCarthyism and the battle of William F. Buckley against the John Birch Society. (It is true that one of the witnesses against HJR 100 testified that he is a member of the John Birch Society.) The witness specifically ridiculed the Eagle Forum and the rest of us who were present. At about 2:27 (two hours and 27 minutes) in, the witness is stopped for mentioning the current President, although other people have mentioned various politicians, including several past and current Presidents. I admire Sonja for her poise and changing to "men who profess to be Constitutional lawyers!" She agreed to follow the rules specific to her and then took the Committee to school. Note the information about the 1974 Texas Constitutional Convention that cost billions of dollars, with no results. Pat Carlson, Texas Eagle Forum, speaks at 2:48 about the very real risks that any Convention could write its own rules and ratification, as was done at the first Continental Convention and in the rules for ratification of the 21st Amendment. 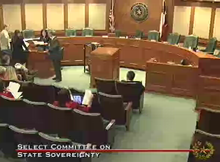 As an example of the problems of supporting fill-in-the-blank legislation, please note that many of the very well-informed Texans who attended the Committee meeting confused two pieces of legislation authored and introduced by Chairman Creighton: HJR 50, which called for a Constitution Convention, and Resolution that was actually on the agenda, HCR 50, which is a pretty straight forward affirmation of State sovereignty and the 10th Amendment to the Constitution of the United States. This Committee meeting is the perfect example of my reason to believe that any “Con-Con,” regardless of what it’s called, would be run by strong personalities - the "squeaky wheels" in our society - and essentially would be lawless and Constitutionally limitless. Read more about the Constitutional Convention on TexasGOPVote.com. Ms. Nuckols wonders why her "opposition" to an Article V Convention is being "ridiculed." After all, her side has held sway for over 30 years telling people about the "dangers" of a convention citing a letter from Warren Burger, more recently citing James Madison as warning against the dangers of a convention and stating that Madison opposed an Article V Convention. She then praises Ms. Harris for her presentation of so-called "facts." This is a rebuttal to Ms. Harris and her comments regarding an Article V Convention. For those only interested in a quick summation, Ms. Harris has either deliberately lied or intentionally misled those reading her "evidence" as to why a convention should not be held and public record irrefutably proves this. The question then becomes: should people listen to Ms. Harris who can't even provide truthful evidence to back up her allegations and more importantly, do people want to establish the government can veto the Constitution? This last question is paramount for at its heart that is the argument of Ms. Harris. She is urging the government not obey the Constitution and that citizens support this. She offers no method or guarantee whereby the government can or will only violate this one provision of the Constitution--only that it must occur because it is a "risk." First as to the so-called "Burger Letter." Please note the date of the letter and the fact Burger is "retired." As discussed in greater detail at http://foavc.org/file.php/1/Articles/FAQ.htm#Q08.6 there are several things "wrong" with the letter. The most glaring example is that 1983, Burger was not "retired" from the Supreme Court. There is more, but length of this reply dictates brevity and the simple fact the letter could not have been written by Burger in 1983 as a "retired" judge is sufficient to prove it is a phoney. See: http://en.wikipedia.org/wiki/Warren_E._Burger . Burger served as Chief Justice until 1986, a fact easily verifiable in public record. The second point which is also discussed in more detail at this site is the fact that Burger publicly supported an Article V Convention and he did not fear it as stated in this letter. In short, the public record refutes Mr. Harris and her so-called "Burger Letter." Ms. Harris obviously would be aware of these facts about the letter and questions surrounding it. She is obviously trying to pull a fast one. As to her second "evidence" of the Madison letter. Historic record proves her conclusion is a lie. If you read http://www.nolanchart.com/article8410.html you will find that historic record shows that Madison was discussing Article VII in his letter, not Article V and that he was merely reflecting a position he had taken at the 1787 convention months before in his comments. Again, a simple reference to a universally recognized historic record, Farrand's Records of the 1787 Federal Convention would have shown the truth but Ms. Harris chose instead to attempt to twist history for her own personal agenda. The question is: should such an important question be decided based on false evidence? I think not. I suggest all go to www.foavc.org and read the over 700 applications from 49 states and study the FAQ section. Learn the truth about a convention. Then realize how many lies Ms. Harris has told about it. Then support a part of our Constitution just like all the rest of it. The states have applied; the Constitution mandates a convention call. It is as simple as that. Since I missed the mind reading course in med school, I didn’t wonder or speculate as to “why” anyone said or did anything at the meeting. I limited myself to my own knowledge and expressed objection to “fill-in-the-blank” legislation (like HJR 34), Conventions and Committees, and pointed out the irregularities at this particular Committee meeting, giving reference to the times in which they occurred. How about firming up the rules (time, location, nomination of delegates, ratification process and limits) for a Con-Con before calling for one?